The Scorpion-class is in a class all by its self, quite literally. This ship was the Invid Regent’s personal landing craft throughout much of his campaign against the Tirolean Mercantile Empire. This ship had limited troop-carrying ability but sported massive offensive weapons systems and lavish crew accommodations for the Regent and his entourage. This publication will refrain from belaboring the fact that the Scorpion-class was by all measures a ridiculous design. The ship’s unique external appearance was most likely down to the Regent’s vanity and desire to have a personal ship which projected an image of terrible power. In this regard, the design was completely successful. 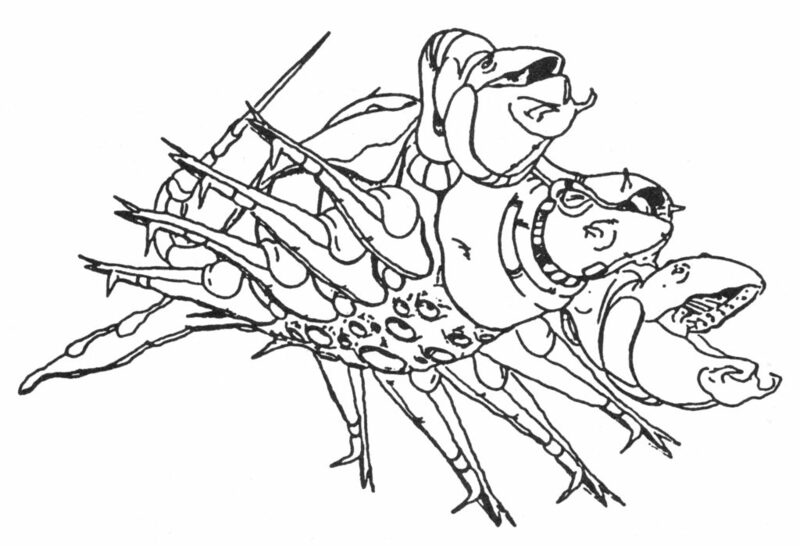 First hand accounts from civilians who were present during the Invid Invasion of Tirol bear witness to the sense of fear and dread that the Scorpion-class’s appearance instilled. So, while this configuration was certainly not ideal from a practical perspective, it did succeed in what was possibly its true design intent. Unconventional looks aside, the ship also had some questionable design elements. 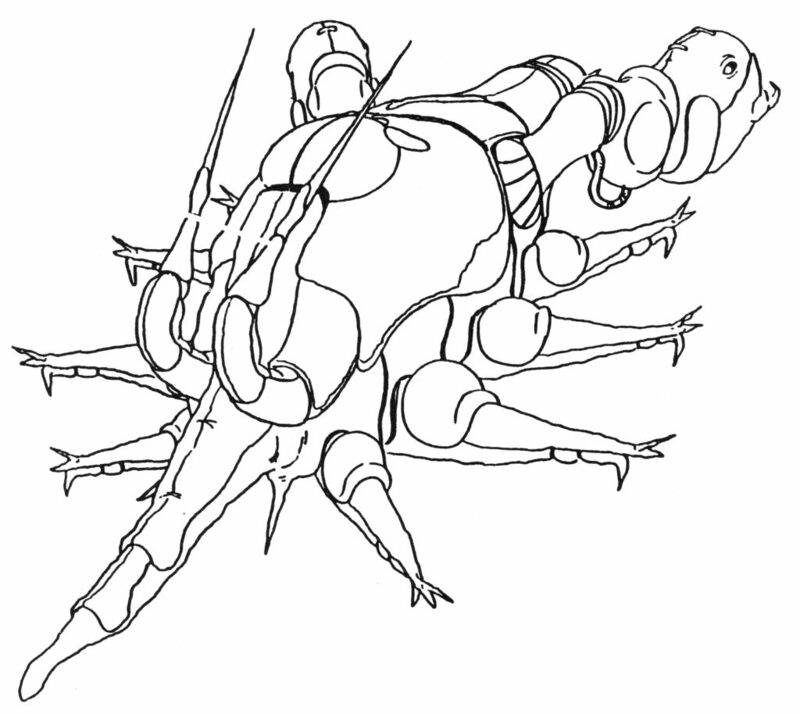 For example, all of its propulsion and maneuvering thrusters were arrayed on the ventral surface. No Vernier thrusters were ever observed to be present on its horizontal or dorsal surfaces. It is speculated that the ships attitude was controlled by two large internal flywheels which could adjust the ships orientation via centrifugal force. Unlike other Invid capital ships, the Scorpion-class had a formidable weapon fit. It boasted three heavy lasers which could threaten most United Earth Expeditionary Force (UEEF) capital ships of the period. 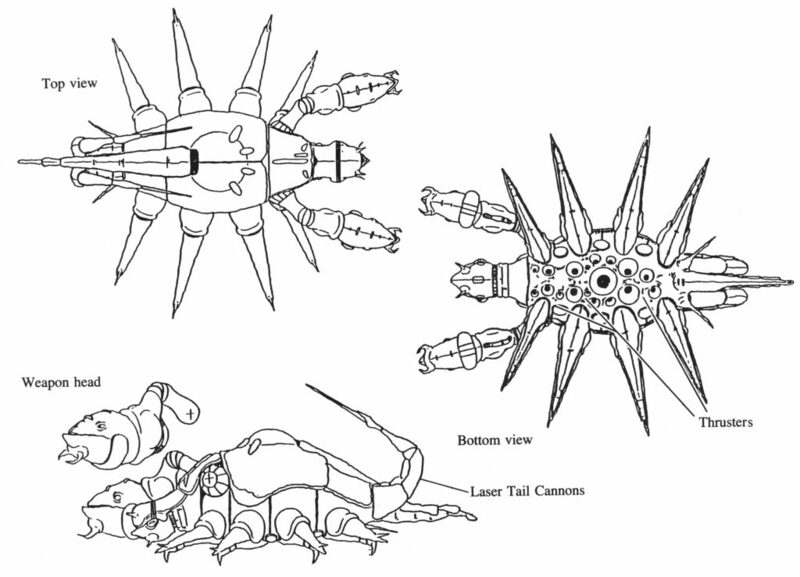 Like all Invid capital ships, the Scorpion-class lacked effective point defense systems, relying on its mecha compliment for this task. The Scorpion-class was utilized exclusively by the Regent for his personal landing-ship. Constructed sometime in the first decade of the 21st century, the Scorpion-class served during the Invid conquest of the Tiresian Mercantile Empire’s local group of systems. The Scorpion-class did not engage much direct combat during this conquest, rather it was used by the Regent to transport him and his entourage to the surface of newly captured planets. When not being used in this capacity, the ship would typically be birthed in either a mobile hive or a Tridacna-class command ship. This ship was destroyed in February 2044 above Optera by UES Icarus, under the command of the renegade General T. R. Edwards. Admiral Breetai Kridanik, who was leading a boarding party in an attempt to kill or capture the Invid Regent, was killed in action during this event. Ship’s crew: 6 stage four Invid. Troops: Varies, up to 360 Invid pilots of appropriate stages for their mecha. Life support limits are for a full combat complement and about 200 supernumeraries. Main Power: Protoculture system, details unknown..
Main Thruster: 1 x located on the center-ventral surface of the craft. Power unknown at this writing. Secondary Thrusters: 8 x located on the ventral surface of the craft. Power unknown at this writing. Maneuvering Thrusters: 9 x large maneuvering jets on the ventral surface of the craft. Power unknown at this writing. The peculiarity of the fact that all this craft’s thrusters are located on the ventral side. No maneuvering jets have been observed on the upper surfaces. It is speculated that the craft used a pair of large rotating flywheels to adjust attitude. Anti-gravity System: 6 x anti-gravity nodes located between each “leg”. Propulsive power unknown at this writing. Fold System: Standard, capabilities unknown. 1 x Anti-Ship Laser Weapon System (Main Laser); located in the “snout” of the craft. Output unknown, judged to be enough to hazard medium sized Terran capital ships, but not powerful enough to damage larger Zentraedi capital ships. 2 x Heavy Laser Weapons Systems (Weapon Heads); one located inside the left and right “heads”. In order to fire, the “mouth” opens, exposing the laser aperture. Output unknown, speculated to be similar (3000 MJ) to the Vickers MP-18 particle gun turret mounted on UEEF capital ships such as the Ikazuchi-class. 4 x Anti-Mecha Lasers (Eye Lasers); located in the left and right “heads”. Output unknown. Observed to be sufficient for scoring critical damage on Zentraedi Reguld Battlepods, but ineffective against heavier armored targets such as Terran Destroids. Field of fire is limited by both the 30-degree traverse of the “heads” and the aperture’s traverse ranging from 0 degrees straight ahead through 90 degree to the side. Elevation is limited to 45 degrees above horizontal and 20 degrees below. This left the craft highly vulnerable to attacks from above, below, and rear. Consequently, the craft required a large contingent of dedicated mecha to protect it from aerospace fighters and anti-spaceship missiles. It must be noted that the “eyes” on the “snout” were sensor clusters, not additional lasers as was previously reported in earlier publications. Full spectrum scanners, active and passive. Protoculture sensors, range in excess of 15 kilometers. It must be noted that in previous publications, the craft’s left and right tail arrays were speculated to have been point defense weapons systems. Though this would have made sense, as they would have provided coverage for the Scorpion-class’s prodigious blind spots, this was later shown to be not the case. It is currently thought that they were either passive Protoculture emissions receivers or that they were a super dimensional space communications array. 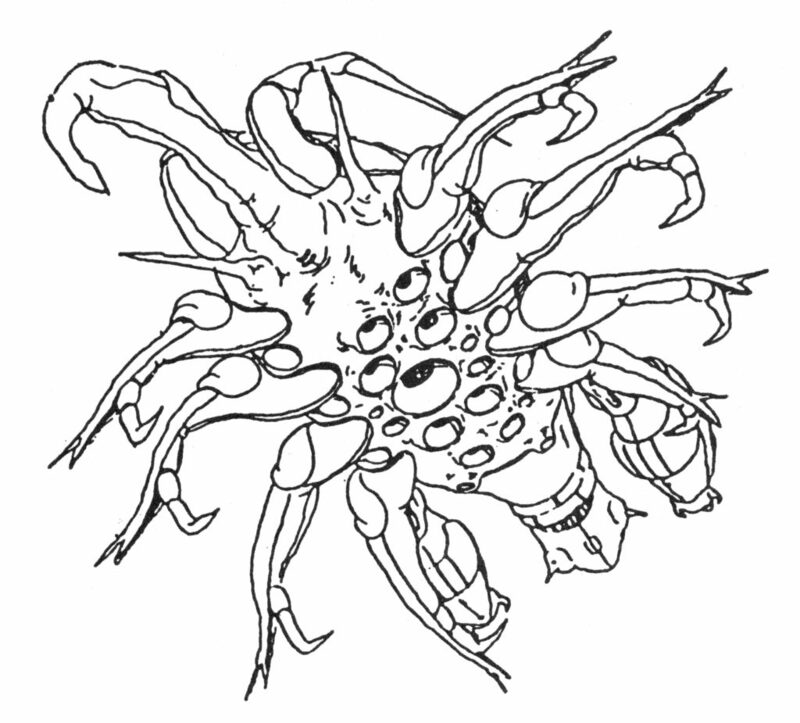 The Scorpion-class was equipped with an integrated bio-computer command and control system, or “Invid Brain” as they are colloquially known. This bio-computer served as the central command and control nod for the Regent’s battle-group. It was capable of real time control of Invid drones and could communicate directly with Invid pilots. Estimates on total complement range up to 528 Invid mecha of various types. This could be accomplished since the Invid mecha did not have the need for ground handling and repair facilities or crew accommodation, since the pilots never actually left their mecha. Consequently, mecha would be stored in tight formation without room for accessibility. 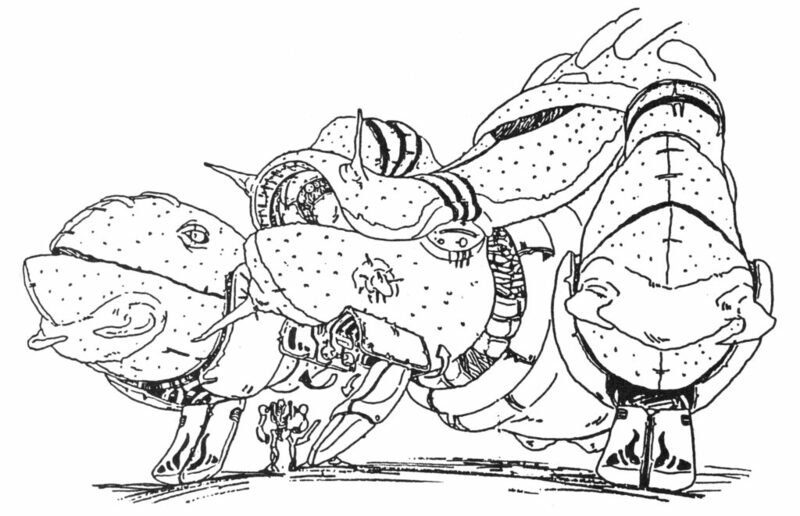 Unlike the Mollusk-class, the Scorpion-class had no ability to quickly launch mecha via large bay doors. Rather, a single crew access ramp provided an ingress and egress point for all mech and crew. 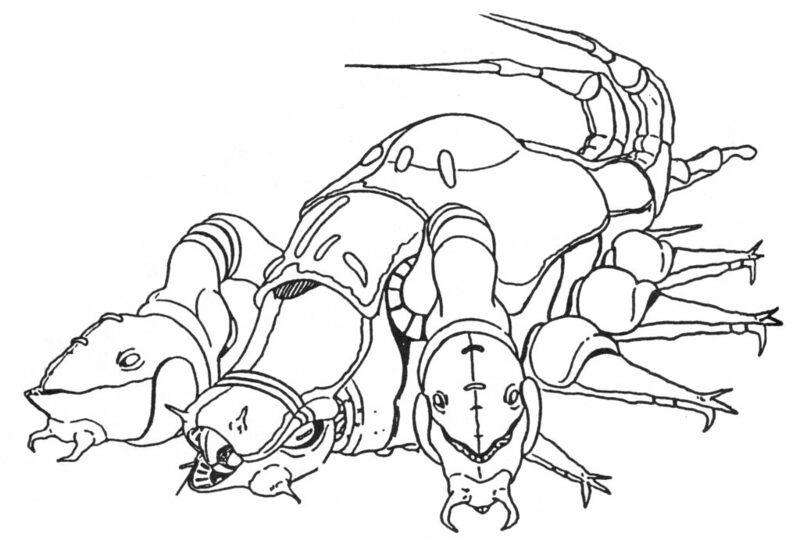 Furthermore, it is suspected that the Scorpion-class rarely carried more than a skeleton compliment of mecha for self-defense. Most of the ship’s interior volume was more likely dedicated to living quarters for the Invid Regent.